Spend the 8th (Mon) among aquatic life with a scuba or snorkeling tour. And it doesn't end there: explore the wealth of natural beauty at Whitsunday Islands National Park, stroll through Catseye Beach, make a trip to Passage Peak, and head outdoors with Jetryder. Start your trip to Hamilton Island by creating a personalized itinerary on Inspirock. Manchester, UK to Hamilton Island is an approximately 31-hour flight. You can also do a combination of flight, bus, and ferry. You'll lose 10 hours traveling from Manchester to Hamilton Island due to the time zone difference. Traveling from Manchester in April, things will get much hotter in Hamilton Island: highs are around 31°C and lows about 26°C. Finish up your sightseeing early on the 10th (Wed) so you can travel to Gold Coast. Take a break from Gold Coast with a short trip to Lone Pine Koala Sanctuary in Brisbane, about 1h 30 min away. There's much more to do: observe the fascinating underwater world at Sea World Theme Park, get in on the family fun at Warner Bros. Movie World, get outside with Pelican Feeding, and take in panoramic vistas at SkyPoint Observation Deck. To see maps, photos, ratings, and tourist information, use the Gold Coast journey planner. Traveling by combination of flight and train from Hamilton Island to Gold Coast takes 5 hours. Alternatively, you can do a combination of ferry, bus, and train; or do a combination of ferry and bus. Plan for little chillier nights when traveling from Hamilton Island in April since evenings lows in Gold Coast dip to 19°C. Wrap up your sightseeing on the 13th (Sat) early enough to travel to Sydney. Sydney is known for nightlife, trails, beaches, parks, and museums. 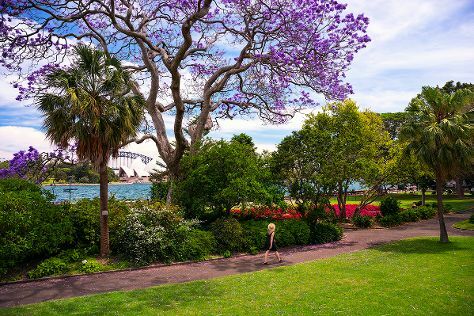 Your plan includes some of its best attractions: take in nature's colorful creations at Royal Botanic Garden Sydney, hike along The Opera House to the Botanic Gardens Walk, kick back and relax at Bondi Beach, and take a stroll through The Rocks. For reviews, more things to do, where to stay, and tourist information, use the Sydney trip planning tool . You can fly from Gold Coast to Sydney in 3.5 hours. Other options are to do a combination of train and flight; or drive. When traveling from Gold Coast in April, plan for slightly colder days and about the same nights in Sydney: temperatures range from 26°C by day to 17°C at night. Wrap up your sightseeing on the 17th (Wed) to allow time to travel to Melbourne. Melbourne is known for museums, shopping, parks, zoos & aquariums, and nightlife. Your plan includes some of its best attractions: admire the natural beauty at Royal Botanic Gardens, take in panoramic vistas at Eureka Skydeck 88, examine the collection at Melbourne Museum, and have some family-friendly fun at Zero Latency. For reviews, ratings, where to stay, and tourist information, you can read our Melbourne sightseeing planner . You can fly from Sydney to Melbourne in 3.5 hours. Other options are to do a combination of flight and shuttle; or drive. Prepare for a bit cooler weather when traveling from Sydney in April: high temperatures in Melbourne hover around 23°C and lows are around 11°C. Finish up your sightseeing early on the 20th (Sat) so you can travel back home.